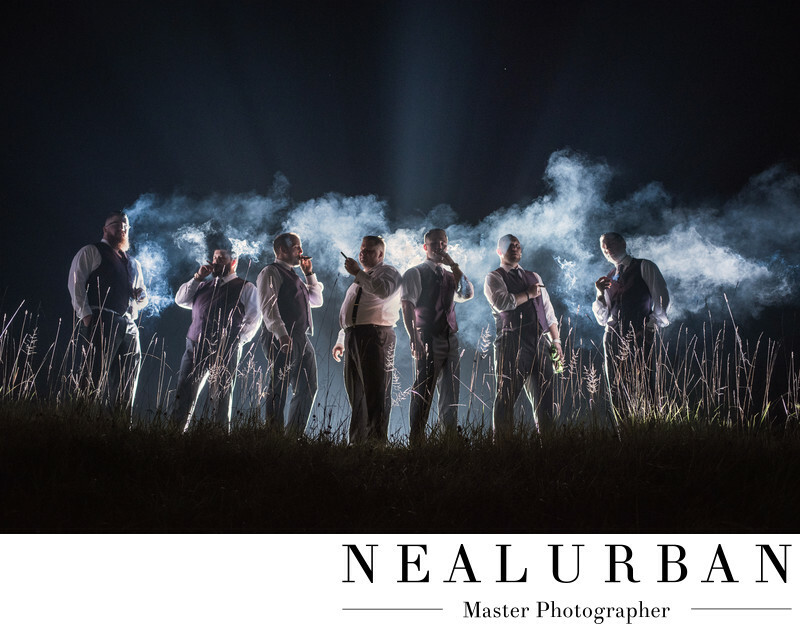 Grooms and groomsmen love cigars. It has become a popular wedding day trend to have a professional cigar roller at the reception. They set up a table and hand roll fresh cigars for the guests. The bride and groom normally have matchbooks made with there wedding date or last names imprinted on them. The guests are allowed to take them home as well! Kristen and Chris had their ceremony at a church in Clarence, NY. It was called St. Mary's. This was cool because St. Mary's is now two churches. They have the old church, where the bride and groom got married and now a newer one. We went to Glenn Falls in Williamsville for the idle. The reception was at Brookfield Country Club in Clarence, NY. Neal Urban loves night photography. While I was inside photographing the dance party, Neal was outside checking out locations for photos. He noticed the groom and his groomsmen were all smoking cigars. He loves smoke for photos. He asked the guys to go on the golf course with him. He needed it to be really dark and away from the lights of the country club. All he wanted was for the groomsmen to smoke their cigars. He wanted one of them to go in and light the grooms. There was a light set up behind the guys. Besides giving back light, the light would help enhance the smoke effect. He did not want to see the faces or details of the guys. He wanted them almost dark. That is why there was no lighting on the front of them. This turned out amazing! When Neal got the image home and into the computer we noticed all little specks that looked like rain. It wasn't raining though. It was pretty humid outside that night. They were bugs flying toward the light. When he zoomed in, there were spiders hanging in the image. We still can't figure out where they came from. There were no trees around the groom and his groomsmen. They were on the middle of the golf course. The bugs looked pretty cool in this image, so they were left in! Location: 5120 Shimerville Rd, Clarence, NY 14031.